Ya I was fine with the stoppage. TJ could barely stand even after the stoppage. Nice win Cejudo. And McGregor vs Cowboy? I need that fight. Would be a slobber knocker for suure. Another good free card tonight. Jose aldo as the co-main. Charles olivera is nice. Damian maia. One of khabib's cousins. 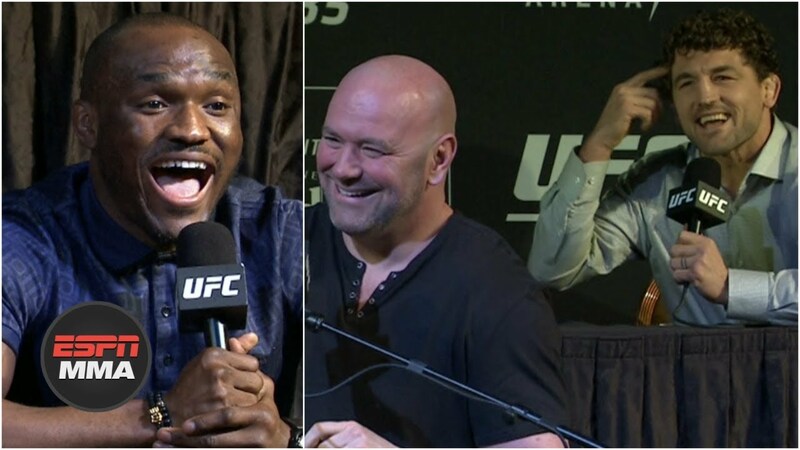 UFC 235 is looking to be an amazing card. Very curious to see what Smith can do against Jones. I think Woodley goes absolutely berserk. Curious to see how Askren looks. And also curious to see if Cody can get a nice bounce victory. Solid 4 fight card. And then Stephens and OSP on the undercard. ESPN seems to be forcing UFC to step it's game up. Last edited by Joey; Sat Feb 2nd, 2019, 08:19 PM. Actually made me want to watch that fight. Lost complete intrest when woodley wasn't smashing colby. The card is looking good. Hope jones loses. Wow aldo. Just an explosion of power. That was awesome. Like 15 shots completely unanswered. And they were all solid blows. Not gonna lie, impressed Moicano managed to stay on his feet that whole time. Tonight's card is really good. Cain to smash francis, kron gracie making his debut against bruce leroy, irish dragon/ vick can be great fight, cynthia cavillo to finish casey, and another fight that might be amazing aljamain/rivera. Good free card. feel bad for cain. francis didnt knock him out, his knee gave out and he turtled. felder looked awesome, aljamain as well. bam bam was seconds away from winning, and had the extra 50k for fight of the night wrapped up when he took that knee. kron looked like maia, i thought cruz was spot on there. i think maybe jeremy stephens would have taken his head off the way he was walking forward hands down though. Meh, another Gracie. Don't get me wrong, Gracie jiu-jitsu was an incredible development but it's not as though it can't be neutralized. That match was the old soup can for the guy - he had no grappling game whatsoever. Let's see him fight someone who isn't afraid of him on the ground and will fire away accordingly. Cain didn't look great right from the start of that fight. Too many injuries, too much time off. Just a complete Ambassador for MMA his whole life, his presser was no different. Through it all he respected his most disrespectful opponents. He signed every hat, shook every hand. He thanked every trainer, teammate, and even opponent from day one. He shed the compliments constantly, instead remaining humble and acknowledging times he may have been lucky. Hell, the guy, even when told he was a bigger canadian sports star than any before him, made a point yesterday to explain that the former athletes didn't have the benefit of the Internet, and social media to place them in the public eye...then he said thank you. I only watched MMA because he made it respectful. I'm not sur eI will contnue, we'll see. Either way, I'm glad we got to experience a fighter like GSP, who proved you could compete without being an angry, dysfunctional child. Guy was a true Martial artist. Gonna be missed. And definitely one of the best UFC fighters of all time. Not as spectacular as Silva but as close to a perfect fighter as you're going to watch. I'm actually glad though that he is hanging them up. He has nothing to prove and you don't want to hang around too long. I always look at what has happened to Sakuraba who was maybe the greatest MMA fighter in his prime and only did harm to his reputation by continuing well after his best before date. Having said that, would have loved to watched him fight Khabib..... I think the UFC missed the boat on that one.